Son's goldfish, Turtle, was dead when we got up this morning. So we made a trip to the pet store only to find that they had no goldfish. I asked the lady working in the fish department what the next cheapest fish was, and she proceeded to tell me that I should not put another fish in my tank because it was too small. She basically refused to sell me a fish to put in the same tank. 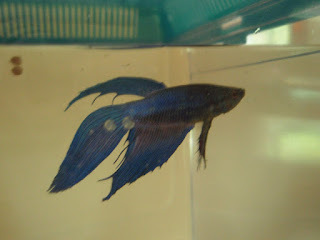 Son was not happy about not getting another silver fish, but was ok with blue Beta instead. So now we have 2 tanks, each with one fish and all seems well with fishy world...for now. Hope Turtle2 is thriving well! I found your blog on Holly's. Is it okay if I link your blog to mine? Hope to see you soon! We are sure enjoying lots of yummy salads. Thanks again!